I invite you to meet a very interesting American Christian. Charles is the publisher of Russian Faith. You can write him at charles@russian-faith.com. I am very pleased to make this announcement. While living in Russia last year I was lucky to get to know Father Joseph and his wonderful family quite well, as they settled into their new home in the magical town of Rostov the Great, which is about 3 hours drive north of Moscow, just before you get to Yaroslavl. It is a delightful corner of old Russia, in the heart of the ‘Golden Ring’. We published an interview with Father Joseph in March which gives a lot of background about him and his story. It generated a lot of interest, getting 17,000 combined views and many comments. Here are the articles on Russian Faith, and Russia Insider. The Orthodox Christianity website published a very interesting interview with him discussing his path from Calvinism to Orthodoxy. He also blogs at The Orthodox Life, and manages a group on Facebook called Moving to Russia. His wife Amy blogs about family life in Rostov. Here is an archive of over 20 articles which he has posted on this website. Here’s the nutshell version: He grew up attending various Protestant denominations in Texas, including Nazarene, Baptist, Methodist, Lutheran, Charismatic, Evangelical, Reformed, and Anglican, eventually finding his home in the Orthodox church (Antiochian diocese), where he became a minister, heading a small rural parish in southern Illinois. He and his wife Amy have 8 lovely children, ages 15 to 2. In addition to ministering he and his family engaged in simple family farming. Father Joseph is a true conservative, and already in the Obama years he and Amy became increasingly concerned at how quickly American society was becoming hostile to Christian values. He decided that his children were at risk, and he began thinking that he would like them to grow up in an Orthodox country, with Russia being the obvious destination. 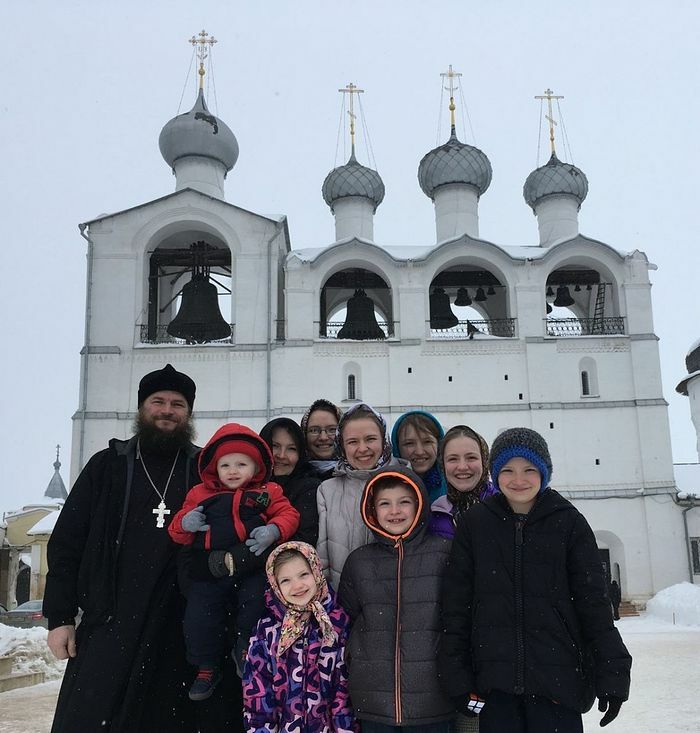 After a few exploratory trips in 2015 and 2016, he moved the family to the provincial town of Rostov the Great, Russia, north of Moscow, in January of 2017. I have been lucky to have had several long conversations with Father Joseph about faith and life, and what struck me after these encounters was what good common sense he possessed about many things, and how well he expressed them, in down-to-earth, simple terms. I suggested to him several times that were he to start a regular podcast, that it would find a following. If you look at the article in Orthodox Christianity on his theological journey, you will see that his views are backed by formidable erudition. Father Joseph has a Masters Degree in Orthodox Theology. He is the author of Which Bible is Better?, a book comparing popular English translations of Scripture, and Friends of the Apostles, a simple introduction to Christian Saints in the Early Church. He loves music, and plays piano, classical guitar, and mandolin. His children are home schooled, and excellent singers. Listening to them sing with Father Joe conducting the chorus is one of the more touching family scenes I’ve ever seen. He is also an IT systems engineer, with an abiding interest in mathematics. He is diligently studying Russian, and, I can attest, is making excellent progress, but not as good as his children, who are truly gifted. I believe Father Joseph’s knowledge and experience of traveling from Calvinism to Orthodoxy is well-suited to help reach my goal of building a forum for American Christians in this publication to discuss how to bring Orthodox Christianity to the West. The Russian Church is good at a lot of things, but to date has not devoted many resources to evangelism beyond its own borders, partly because of the enormous task they have had at home of bringing Christianity to their own people. In the 19th century, the Russians were more active. There is unprecedented interest among Westerners about Orthodox Christianity, but along with that, a lot of confusion. Many find it foreign and inaccessible. Hopefully this forum will help in their quest, and become a fount of ideas and enlightenment around this issue. To continue to attract and retain talented individuals like Father Joseph, we will have to substantially increase donation revenues. Our community has done a great job so far, but our readership is still relatively small. We need to rely more on a few larger donors to make Russian Faith what it can be. If you are interested in making larger gifts, please contact me directly at the email above. If you haven’t contributed yet, please do. Every amount helps, and we need all the help we can get. Stay tuned for further messages from Father Joseph and the staff about our recent achievements, new initiatives, and where we are headed. I welcome him to Russian Faith, and I am sure you will agree with me, we are very lucky that he is joining us.